The Itsy Bitsy Spider Crochet: Plush Team in Candyland! 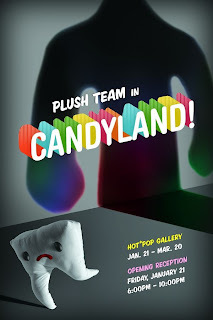 A heads up to all you plush lovers on this amazing show opening THIS WEEKEND in Milwaukee, WI. The Itsy Bitsy Spider will not be there, but there WILL BE amazing plush designs from all over the world -- including amigurumi designs from Yummy Pancake, Out of the Frame and more! Who: The Plush Team is an international group of plush artists who create unique dolls, toys, soft sculpture and all manner of soft creations. Together for the first time in a gallery setting, The Plush Team in Candyland show will feature sewn, knitted, and crocheted tasty confection creations. Make plans to attend the opening reception, where many participating artists from all over the United States will be in attendance, a "candy bar" featuring the artists' candy faves, and super sweet libations to keep everyone from getting too salty. The opening reception is Friday, January 21, 2011 from 6p.m. to 10p.m. RSVP for the opening reception on Facebook!